In 1972, China and Britain established diplomatic relations at the ambassadorial level. During the past 41 years, despite ups and downs, relations between the two countries have been moving towards the direction of a healthy and stable development and becoming more mature. China and Britain established comprehensive partnership in 1998 and then comprehensive strategic partnership in 2004. The two countries have established a number of dialogues and consultation mechanisms, including annual meeting between the Chinese Premier and British Prime Minister, Economic and Financial Dialogue, high-level people-to-people exchange mechanism, Strategic Dialogue, Joint Economic Committee, Joint Committee on Science and Technology, ministerial meeting on education and the Dialogue on Defense Strategy. The two sides have maintained close communication and coordination in major global issues of reform in the international financial system, global trade talks and climate change. The two sides have deepened people-to-people exchanges and cooperation. Nearly 50 pairs of provinces and cities in China and Britain have established friendly relations, and dialogue and exchange mechanisms between the two governments, parliaments, political parties, youth and women and local governments are playing an active role. There are over ten pairs of direct flights between major cities in China and the UK. There are currently over 130,000 Chinese students studying in the UK, and Britain leads Europe in the number of Confucius institutes and Confucius classrooms which it has established. Each year in the past few years, nearly 100 cultural exchange and cooperation projects are carried out between the two countries. The two sides have strengthened international cooperation. As permanent members of the UN Security Council and major members of G20, China and Britain share common responsibility and broad interests in maintaining world peace and promoting global economic prosperity. The two countries have enhanced exchanges and cooperation in promoting global poverty reduction and development, improving public health and medical services and coping with climate change. These efforts have achieved many positive outcomes. In 2013, China-UK relations have returned to the right track after some ups and downs. Since the end of September, senior British officials have visited China in succession, including Energy Secretary, Chancellor of the Exchequer, Transport Secretary, Environment Secretary and the Mayor of London. Vice Premier Ma Kai and UK Chancellor of the Exchequer George Osborne co-chaired the Fifth Economic and Financial Dialogue, with outcomes covering macro policy coordination, trade and investment promotion and strengthened financial cooperation. The sides are committed to developing economic and financial relations that are oriented towards the future, mutual benefit and win-win results and that are led by growth. From December 2 to 4, Prime Minister David Cameron will pay a visit to China with the largest delegation ever of senior officials and business leaders. During the visit, leaders from both sides will update each other on their respective views and experience of development and draw up a blueprint for future China-UK cooperation. Recently, the Communist Party of China held the Third Plenary of the 18th CPC Central Committee, sounding the clarion call for a new wave of reform in China and declared a new stage in China’s reform. China is comprehensively deepening reforms, which will powerfully drive the development in China, bring new and greater opportunities for China-UK cooperation, and significantly promote China-UK exchanges and cooperation in trade, investment, finance and science and technology. 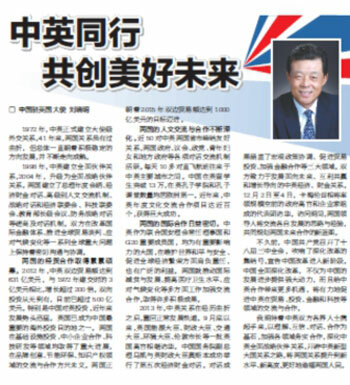 I am eager to see that understanding, mutual trust, dialogue and cooperation stand fast as the cornerstone for our relations and the Chinese and British people will join hands to strengthen practical cooperation in various areas, deepen China-UK comprehensive strategic partnership, blaze a new path for a new type of relationship between major countries and take China-UK relations to a new level so as to bring even greater benefits to the two peoples. Established in April 1985, International Business Daily, a leading daily newspaper with a circulation of over 420,000, is the most widely distributed overseas Chinese financial newspaper.